The Castle of Ioannina is the city’s reference point. The present form due to Ali Pasha, who rebuilt the castle in 1815 nearly from scratch. Access to the castle until 1913, was only possible if the internal lowered the connecting staircase that connected the outside world with its castle and that’s because the lake and the water moat touching the walls. From the main gate, where the Turks hanged the martyr George, patron of Ioannina, we enter the castle. The portal is at the end of the street Averof. Above the main gate discern the coat of arms of Ali Pasha. On the right side, rises above the wall the tower built during the Turkish occupation of the “Venetian” clock of the castle. The clock that disabling the Italians in 1917 and recently replaced by Ioannina. The narrow streets lead us to the hill to the mosque of Aslan Pasha in northern citadel. Built in 1618 by the homonymous Pasha to commemorate the crash of the revolution of Dionysios Philosopher (1611) .Despozei in perhaps the most beautiful part of town overlooking the lake, the island and the city itself. In the place that occupies today the mosque, it was the church of St. John the precursor destroyed in 1611. Today the site serves as the Municipal Museum. Right and left, as it begins the uphill road, we find many buildings of Turkish rule. On the right there are the Turkish baths (hamam), built with unique architecture (cross-shaped, with vaulted dome). They included changing rooms, bath rooms, and retreat. The baths were communication space, especially for women, for which planned and special preparation bath. On the left our known Soufari Saray. It was storey building with a stone exterior staircase and wooden roof. This is the camp of Ali Pasha, where trained and protagonists of ’21 (Od. Androutsos Karaiskaki M. Botsaris Ath. Diakos, etc.). The Turkish library built in the early 19th century. Includes room with square hallway and two rooms on the edges. It is exquisite art the vaulted roofs, survives intact, not only rescued books or manuscripts. Leaving the north acropolis, we go inside the fortress, the Kale. Before we get to this place, we find the tree where martyred leader klephts Katsandonis, 1807. The portal is kept in very good condition and is commanding. Above the arch of the two lions were embossed with the word “Aslan” stolen. At the far left, rises the Fethiye Mosque which was built in 1618 in place of the Christian church of the Archangel Michael.Next to the mosque, stands the marble base of the family tomb of Ali Pasha. It only buried the headless body and his wife Emine. His head was buried in Istanbul together with his children, Mukhtar, Veli, and Mehmet Salih, executed by order of the sultan. The nice iron railing stole possession. In the place where the Byzantine museum operates since 1995, was the Saray Ali Pasha, which was built in 1789 and was an administrative center, which burnt down in 1870. Right from the Byzantine museum are the remains of the harem of Ali Pasha. Tower Voimoundos (bastion) is one of the few medieval buildings that survived. It bears the name of Norman conqueror of Ioannina (1082 AD). During the Turkish housed financial services in South of Ioannina Castle Citadel near the tower Voimoundos and in contact with the church of St. Anargyroi preserved historical gunpowder warehouses of Ali Pasha. 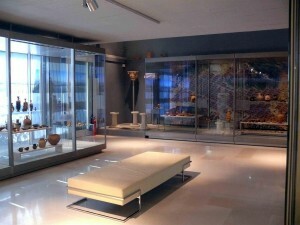 The Archaeological Museum of Ioannina (A.M.I. below) located in the center of the city of Ioannina, Epirus modern capital, land owned by the Ministry of Culture and in a prominent position in the so-called hill Litharitsia. The A.M.I. built in the decade of 1960 (1963-1966) according to the architectural design of the prominent Greek architect Aris Konstantinidis. The main purpose of the erection of A.M.I. was to house archaeological treasures of Epirus in antiquity to post-Byzantine times, as well as the collection of Greek painters of the 19th and 20th c., gift of the Association of the “Friends of Ioannina”. For several years the buildings complex of A.M.I. It was the seat of the then Committees Classical and Byzantine Antiquities. Once in 1999 it achieved the exclusive use of A.M.I.both the report of jurisdiction finds IB Ephorate of Prehistoric and Classical Antiquities (E.P.K.A.) and its functioning. The final evacuation of the area occupied by the maintenance workshops of 8 Inspectorate of Byzantine Antiquities took place in 1992, year of relocation and Byzantine exhibits (see. Below) the new Byzantine History Museum. In 1999 they removed and the artworks of the so called “Gallery” part of which now adorns the Municipal Gallery of Ioannina. In 1970 they opened the gates of A.M.I. to the public with a permanent exhibition timeless character and exhibition approach dictated the then conditions and perceptions. The exhibition of prehistoric and classical antiquities curated by Julia unforgettable Vokotopoulou while that of Byzantine and post-Byzantine findings and the “Gallery” was made by the then fifth EBA. Of the total of five halls of A.M.I. only two (and a spacious central corridor) hosted the works of Greek and Roman antiquity of the major until then known archaeological sites in Epirus (eg Dodona Kassopi, Nekyomanteio, Vitsa) or other individual findings (eg treasure Bronze objects Katamachis, sarcophagus from Ladochori Thesprotia). Also, some findings, mainly architectural, placed in the boxed grid building atriums. Today, it remains almost as it was the initial report, the spirit and the tone of which, as expressed Julia Vokotopoulou the unique guide A.M.I. ever issued is Panepirotan character. In the course of time and the gradual availability and other halls of A.M.I. the report of the cultural residue of antiquity expanded and there outside the hall D. [The reference to the halls of A.M.I. with letters of the Greek alphabet used in this document to refer to existing regional planning]. Hall D from 1992 serves as recording space of continuous inflatable ancient crowd that come to light from excavations carried out and the major projects that oversees the IB ‘E.P.K.A. competence in the four counties. In part D of the room temporarily housed administrative offices of the Ephorate. In the 1980s the hall C placed finds from excavations newer (eg Tombs Pogoni, Dourouti) and the donated Mela Collection with works of Greek antiquity. An important addition (1996) to the current report is the approach to modern museographical presentation of the findings from the Cemetery Liatovouni (Konitsa) to showcase in the central corridor. Meanwhile, during the 1990s he organized in A.M.I. variable interest events and temporary exhibitions (eg Ancient Musical Instruments). R Hall, and in view of the temporary shutdown of A.M.I. 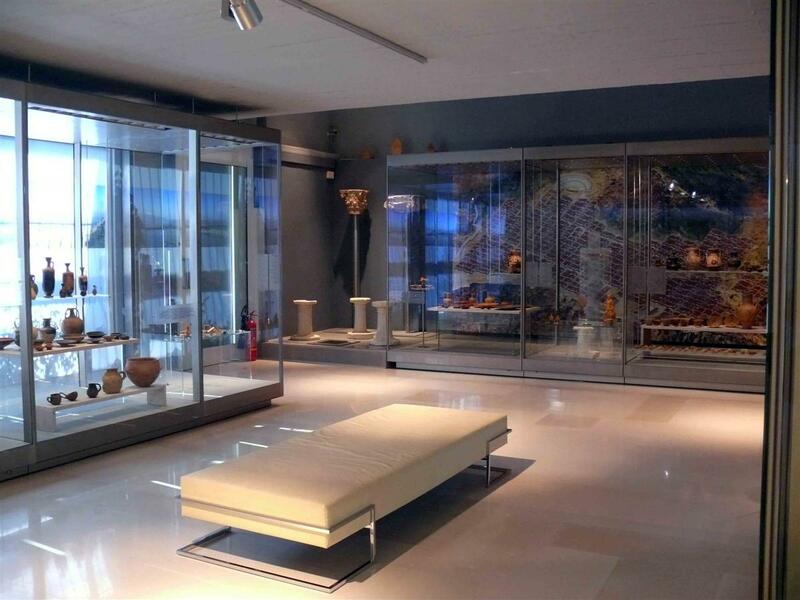 in July 2001 inaugurated by the Minister of Culture the following two temporary exhibitions: “Treasures of Amvrakia – On the trail of the capital of King Pyrrhus ‘and’ Neolithic Continent. ” The purpose of these reports is guests A.M.I. become partakers both the treasures of one of the most important cities of the edge of Epirus in antiquity and who had never until now been exposed as an organized body in A.M.I., and secondly know the findings of the latest surveys first document the cultural character of the Neolithic in Epirus. Ancient Dodona was a place of worship of Zeus and Dione. It is located about 2 km. From the settlement of Dodona, in closed, elongated valley at the foot of Mount Tomaros at an altitude of 600 m.
The first evidence for the existence of the oracle of Dodona as a place of worship placed around 2600 BC .. It is the oldest oracle encountered in Greece. The legend says that from Thebes of Egypt threw two pigeons: one landed in Libya, where they built the temple of Jupiter Ammon, and the second came at Dodona, where founded the oracle. 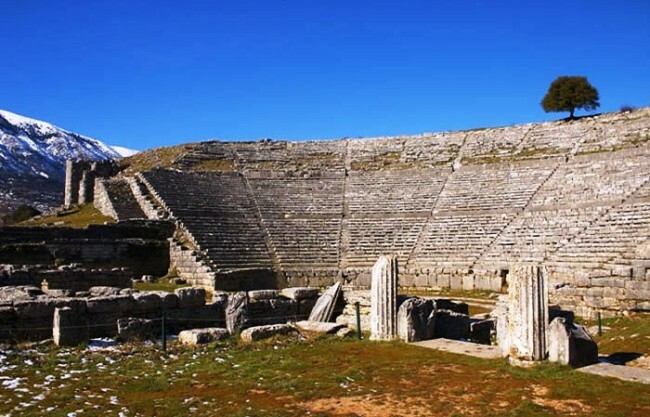 Ancient Theatre Dodona built in the third century BC for Pyrrhus reign followed the plan are all Greek theaters. Could accommodate 18,000 spectators and was the largest of its time. 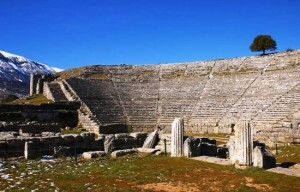 The theater suffered successive disasters, reconstructions and configurations in the centuries that followed the decline of the kingdom of Epirus and during the Roman conquest was used as an arena. The wall that is in front of the first seats built at this time to protect spectators from the beasts. From the 4th century AD ceased to function. The first excavations and restoration work at the archaeological site of Dodona began in 1875 and continue until today. Ancient Theatre Dodona is located 22 km from Ioannina. The opening hours of the Archaeological Site Dodona, are daily from 8:00 to 15:00. Telephone 26510 82 287.